CleanMyMac X has a fair amount going for it, except its malware detection module is a big letdown. CleanMyMac X is MacPaw’s catch-all software crud and gunk remover for the Mac. This version swings for the fences, with new features such as a malware scanner, extensions manager, and a universal updater for all of your application programs. This is in addition to CleanMyMac X’s core functions, which include tools for smart cleanup, system junk, mail attachments, iTunes junk, trash bins, a large and old files scanner, privacy scanner, and application uninstaller. CleanMyMac X's new menu bar menu. 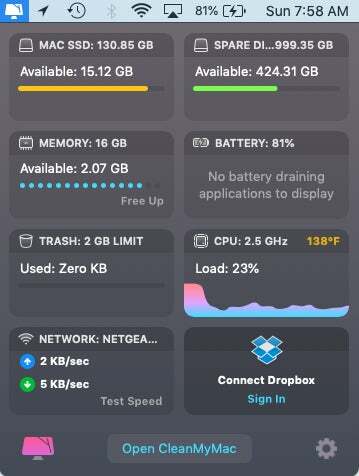 CleanMyMac X is also complimented by an improved menu bar menu that can be clicked to take note of handy information such as available hard drive space, available RAM, network connectivity speed, CPU usage, and a quick means of opening your Dropbox account. An improved Notification system lets you know which programs are lagging or suspended, but isn’t as obtrusive as seen in previous versions of CleanMyMac. As with previous versions, the modules work well, and users can either performed generalized, overarching system scans or embrace a fair degree of customization and specify what they want looked into and to what extent. 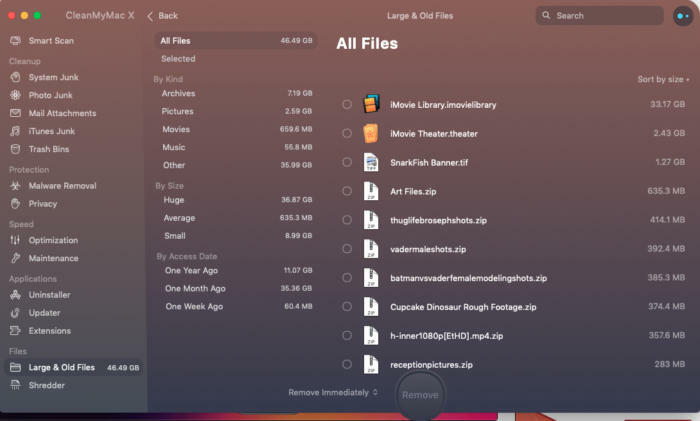 CleanMyMac X has built on its core strengths of finding gigabytes of assorted crud—cache files, unused language files, and duplicate files—to clear up room at a speedier pace than previous versions. New modules such as Extensions and Updater come in handy. With the Extensions module (which almost harkens back to Mac OS 9’s Extensions Manager), you can quickly manage extensions without having to dive too deeply into the macOS. The applications updater, in turn, provides a quick means of finding every application you have and updating them on the fly, which becomes almost addictive in its ease of use and functionality. As with CleanMyMac 3, the Large & Old Files module helps you quickly see what files are devouring the most space on your hard drive and quickly erase them at will. This pairs well with the Uninstaller module, which helps you quickly locate your application programs and erase them as well as their support files to rid them from your Mac forever. The Large & Old Files module. All this combines with a decent new Maintenance module, which offers an assortment of system-level clean up scripts (Free Up RAM, Run Maintenance Scripts, Flush DNS Cache, Speed Up Mail, Rebuild Launch Services, Reindex Spotlight, Repair Disk Permissions) to help free up resources. The effort is appreciated, but free utilities such as Titanium Software’s Onyx have historically done this better with more modules and customization. Unfortunately, the Malware module is where things fall apart. Over the course of days of testing, I installed several pieces of known Mac malware and adware on a MacBook Pro running macOS 10.14.1 Mojave. These samples included MacKeeper, assorted free-and-questionable video players, and entirely questionable utilities that purport to speed up your Mac yet historically find “infections,” change your web browser and search engine preferences, activate the speaker to tell you that your Mac has been corrupted, and advise you to call an 800 number where a technician can help resurrect your computer for a fee. Upon running CleanMyMac X’s Malware module, which claims to be able to find and clean out malware with confidence, the module missed every beat, locating none of the malware or adware and happily reporting back that my Mac was clean, devoid of malware and ready to go. 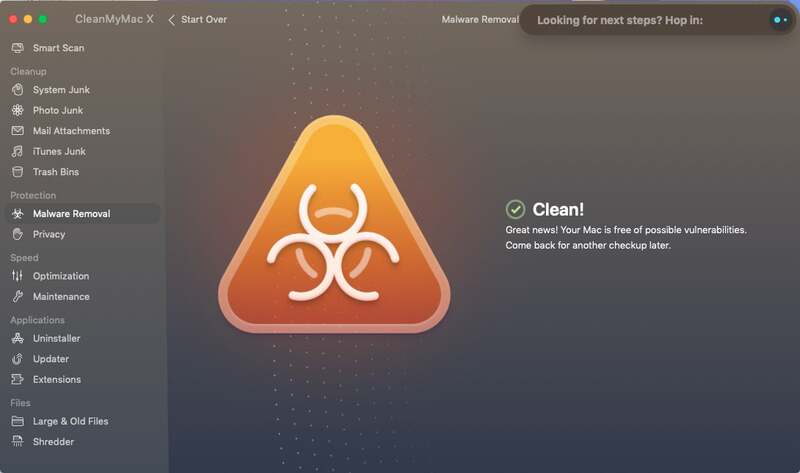 I used a free version of Malwarebytes to locate the malware, quarantine it, delete it, reboot my MacBook Pro, and ensure that the malware was gone. The Malware module reported a clean sheet during testing, despite the fact that we purposely installed known malware on the test platform. 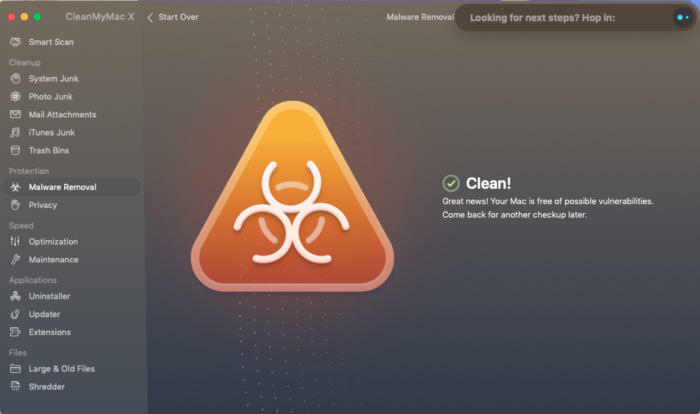 This presents an enormous problem and unless MacPaw improves upon the malware module, this feels like you’ve opened the gates to malware and adware on your Mac if you’re only using CleanMyMac X for protection. MacPaw says that they are working on an update to address this issue. CleanMyMac X retails for $39.95 for a one-year subscription for a single user and $89.95 for a one-time payment for a single user with the MacPaw store offering different purchase tiers depending on licensing needs. The software is available in a trial version, which lets you run as many scans as you want, clean up to 500MB of system junk, and run assorted tools a limited number of times. CleanMyMac X has a fair amount going for it, especially in terms of its speed, new modules, and improved user interface, and it could represent a significant step forward for the program. Sadly, the Malware module seems to be where MacPaw has shot itself in the foot and will need to spend a number of caffeine-fueled evenings fixing this in a forthcoming update. Still, this doesn’t have to be an absolute deal breaker, and, if coupled with a focused malware utility such as Malwarebytes, CleanMyMac X does offer its own advantages with its core advantage of removing gigabytes upon gigabytes of system junk in tact and worth consideration.